"But about that day or hour no one knows, neither the angels in heaven, nor the Son, but only the Father. Beware, keep alert; for you do not know when the time will come. It is like a man going on a journey, when he leaves home and puts his slaves in charge, each with his work, and commands the doorkeeper to be on the watch. Therefore, keep awake -- for you do not know when the master of the house will come, in the evening, or at midnight, or at cockcrow, or at dawn, or else he may find you asleep when he comes suddenly. And what I say to you I say to all: Keep awake." The ideas of watchfulness, preparation, and readiness are clearly present in this passage from Jesus' eschatological discourse. We wait for many things in our lives, some of which are so routine that we give them no second thought, and others which require much preparation. We can generally plan for future events which have a fixed arrival date, but there are certain things that require daily vigilance because we know not the day or the hour of their coming into our lives. Jesus' parable of the doorkeeper challenges us to be always watchful as we await the coming of the Lord. It seems that life is one period of preparation after another. When we are in school we work hard in the primary grades so as to advance to the intermediate level. Then we must prepare again for high school and so again for college. Even when we get to the college or university we prepare ourselves for the first job. We labor long and hard hours to prepare for our next assignment or the promotion that is our goal. We prepare ourselves at school, in our job, in fact, in every facet of life. One might logically ask, will I ever be ready? The simple answer, of course, is no. Life requires that we move from situation to situation, relationship to relationship, job to job. The first time when we think we are fully ready and become complacent, life throws us a curveball and we find ourselves lost. There is a need to be always watchful and make preparations because we don't know what life will bring our way. Watchfulness in our relationship with the Lord is of the greatest importance. If we slack off and fail to prepare ourselves in a relationship or job we may lose a friend or position. But if we fail to be alert, make preparations, and watch for the Lord, then we may miss God and lose salvation in the process. Let us always be watchful for God's coming. We will never know the day or the hour. 1. Imagine picking up the Sunday paper, opening it, and reading in giant letters, Jesus Christ Will Return on December 25! What would we do? How would we react to this astonishing information? I think there would be two basic reactions. Some of us, out of fear, would change our lives immediately. The Lord is coming and we are not ready! We might start going to church more often, probably every day. Prayer would become a much higher priority in life. We would pray not only in the morning and evening, but many times each day. We would seek reconciliation, with a member of our family, neighbor, co-worker, and certainly with God. Others might have a very different response. Some of us might do nothing differently. Some in a defeatist attitude might say, "There is nothing I can do at this late hour. God has already decided my fate. I might as well continue what I have been doing all along." There are others who might not change a thing that they are doing, but not in a defeatist mode. Some of us hopefully would say, "Isn't this the event for which the world has been waiting? Isn't this the reason for which I came into the world?" Possession of such an attitude would allow us to continue doing what we have always been doing, confident that our preparations have been sound. Life, it seems, is one big process of preparation. When we are young each year seems to be preparation for the next. When we are in elementary school we prepare for junior high, and in junior high we work hard to ready ourselves for high school. The preparation process continues into college and to our first job, but it does not end there. One job leads to a second or to the promotion which we justly deserve. One might naturally say, "Will we ever be fully ready?" On this First Sunday of Advent we celebrate our need to prepare. In this season we prepare for the Lord's coming in history, but we also prepare for his Second Coming at the end of time (the Parousia). Today our readings focus on this latter idea. Jesus' birth into history happened one time; it will never occur again. We can celebrate this Advent and prepare, however, because the Lord can and will return into our hearts if the invitation which he extends is accepted. Jesus will come, however, as the Gospel indicates, when we least expect. Therefore, we must be ready. Advent is a time for us to reevaluate our lives and see how we have been doing with the invitations extended by God. 2. As individuals and community we are constantly waiting. We wait in lines in the market, the bank, and stores. We wait for events. We wait for the big game to start on television, for the movie to begin in the theater, for the arrival of a family member or friend at the airport. Most of the time we wait with certain knowledge that something will happen at a prescribed time. We all wait for birthdays (even though at times we may want to forget), but we know precisely when the date will arrive. We wait for the next three-day weekend, but again we know the event's exact time. We wait for Christmas, but have learned from childhood that Jesus arrives on December 25. Sometimes we wait for things that eventually will come, but there is no way to know when they will happen. Farmers wait patiently for the rain to nurture the fields, but there is no way to predict its arrival precisely. After a long winter all of us look forward to the blossoms, flowers, and budding trees as signs of spring, but again we cannot know when the miracle of new life will be manifest. We look forward with longing for visits from family and friends, but often do not know when they will arrive. These unexpected periods of waiting force us to prepare in a different manner. We must be more attentive and vigilant. We cannot be lazy; the event for which we wait may happen and we will not be prepared. We must be patient and ever watchful or we may miss God's presence and be lost forever. Advent is a time when we wait. We wait for the coming of the Lord in history, but we also wait for his coming at the end of time. The first event allows us time to prepare; the second requires constant vigilance. On this First Sunday of Advent, the parable of the doorkeeper challenges us to be watchful and prepare now, for we do not know the day or the hour. 1. How do we wait for the Lord? Many people wait with fear and apprehension about many things over which they have no control. If we do our best, as broken and incomplete as we are, to prepare now for Jesus' coming at the end of time, there is no need to be fearful or worry. We must take make every effort to respond to God's call now so that if the Lord's arrival is forecast we need change nothing in our lives. 2. What is our state of readiness for the Parousia? The belief that one is invincible, a "disease" that often plagues youth, is unfortunately present with many people. We think that tomorrow will come as assuredly as the sun will rise. Such an attitude does not allow one to prepare for the coming of the Lord. 3. Is my trust in God sufficiently strong that I can demonstrate patience in my day-to-day actions? Patience is a virtue which for many does not come easily. As the expression goes, "Grant me patience, Lord, and give it to me today!" Being patient is an important form of watchfulness; it says that we are prepared now, but can wait until the Lord comes. 4. What responsibility do we have to assist others in their readiness for the Lord? Discipleship asks many things of us, including the need to be evangelists. We cannot be satisfied that we have prepared ourselves and left others to their own devices. If we have the ability to be present, to give advice, to assist people in their daily preparation for the Lord, then as God's people we must so act. 5. What preparations are necessary in my life to be fully ready for the coming of the Lord? We all need to take the sometimes perilous yet always necessary journey of introspection. Who am I and what does God ask of me? If God calls me this day am I ready, or is there unfinished business to which I must attend? We must do our best to feel secure in the presence of the Lord each day of our lives. Chapter 13 of Mark's Gospel is known as the apocalyptic or eschatological discourse. It is the only place in this, the first Gospel to be written, where Jesus delivers a long consecutive teaching on a single subject. This chapter uses two forms of literary genre, apocalypse and farewell discourse. These styles were familiar to the people of the day and would have allowed them to understand the Lord's teaching fully. Mark 13 combines these two literary constructs as Jesus' final exhortation before the narrative recounts the Lord's passion, death, and resurrection. Apocalypse was a literary construct, very popular and widespread with the Jews between 200 B.C.E. and 200 C.E., in which an author revealed the substance of visions which had been granted him or her. Readers understood these visions as a picture of contemporary life or impending events. Apocalyptic literature was a means of sustaining hope and perseverance among an oppressed people in a time of imminent danger, downfall, or ruin. Readers were encouraged to believe that if apocalyptic prophecies of disaster, such as those proclaimed by the prophet Daniel, had been fulfilled, then the forecast of subsequent salvation would also come to pass. Farewell discourses were another common literary model. Great religious leaders of the past, such as Jacob, Moses, Samuel, and David, when they knew they were about to die, summoned their family, disciples, or subjects and delivered to them what today would amount to a last will and testament. Such a speech might include past lessons, but it also proclaimed a summary of future prospects, especially forecasts of danger and suffering. Hearers of such an exhortation were advised to remain faithful through all future trials. A survey of the future was, like apocalyptic literature, believed to be based upon divine revelation. Thus, what was said was built on solid ground and could be used to warn, admonish, and instruct. Mark's eschatological discourse seeks to explain to his readers what Jesus, in his capacity as the Son of Man, means for Jerusalem, for Christian disciples, and for all people. The evangelist uses the apocalyptic genre at this stage in his Gospel to highlight the divine vindication that Jesus will experience in the future. Mark cautions his readers to read the signs of the times (vv. 3-8) and forecasts future persecution (vv. 9-13) and the coming of the Son of Man (vv. 24-27). The chapter serves to balance his rather stark portrayal of the earthly sufferings of Jesus by widening the horizons of the reader to the positive results which his passion and death will bring to the world. The events related in this eschatological discourse thus provide Mark a means to describe God's final saving intervention in history. Mark 13 closes with two parables, the image of the fig tree and the figure of the doorkeeper. While Jesus uses the fig tree to teach a lesson on recognizing the time when the Lord will return, the parable of the doorkeeper more specifically exhorts all to be watchful and wait for the coming of the Lord in the face of opposition from the world. Mark's readers certainly understood the parable to be an allegory: Christ is the departing Lord; the Parousia will mark his return. The doorkeeper represents the waiting disciples and the community of faith. The divisions of the night symbolize the lapses of time before the second advent of the Lord. The parable was most likely addressed to the scribes, who claimed to possess the keys of the kingdom of heaven. This is a "crisis" parable which the primitive Church applied to its own situation, perceiving itself between the crises of the Lord's death and the destruction of Jerusalem. The idea of watchfulness and vigilance was, therefore, clearly relevant to the people who first read Mark's words. The doorkeeper must watch now in order to be ready when the contemporary coincides with the future at the moment of Christ's return. The repeated call to watchfulness in verses 33, 35, and 37 indicates how Mark wanted not only the parable, but the whole eschatological discourse to be understood -- not as a guide in calculating the time of Jesus' return, but as an invitation and a warning to live one's life at each moment in preparation for our future meeting with the Lord. This personal exhortation by Mark enhances the validity of the entire discourse. The parable of the doorkeeper contains passages which have challenged scholars for generations. Verse 32, "But about that day or hour no one knows, neither the angels in heaven, nor the Son, but only the Father," reveals Mark's understanding of Jesus, not that defined at Chalcedon in 451. Some try to explain the verse by appealing to the communicative knowledge that Jesus (the Son) has for his mission, but this idea arises from a perspective that is not that of the evangelist. In its Marcan context the verse simply means that although the Parousia is imminent its precise date in not known. Scholars argue over the authenticity of Jesus' words. Some believe that no Christian would be so bold as to place limits on Christ while others doubt Jesus ever referred to himself absolutely as the Son. (There is no parallel in Mark and only one doubtful reference in the other Synoptics, Matthew 11:27 and Luke 10:22.) Verse 37, "And what I say to you I say to all," lifts the whole discourse beyond the limits of the narrow perspective of the crisis of the day, the impending capture of Jerusalem and destruction of the Temple, and makes it applicable to all. Concluding in this manner, Mark thus makes universal the discourse and by extension the whole of Jesus' teaching. In the life of the Church, our celebration of the First Sunday of Advent marks New Year's Day. As the first liturgical season, Advent provides many opportunities for renewal and hope. We generally think of Advent as the time which precedes Christmas and thus prepare for the Lord's coming in history. This is certainly true, but the season is twofold: a preparation for the Incarnation and for the Parousia, the second coming of the Lord. The preparations we make for Jesus' arrival on Christmas Day are different than those necessary for the Parousia. We know with certainty when Christmas will come and thus there is no great sense of urgency; we can procrastinate if we wish. Preparation for the Lord's second coming is very different. Scripture tells us that this event will come, but we have no idea when it will occur. Thus, a greater sense of vigilance is required; we must always be ready. On the First Sunday of Advent the Church chooses readings which concentrate on this second theme of watchfulness and preparation. We begin a new liturgical year by reflecting upon the ultimate reason for our existence, the journey back to God. We do not like to think about death; it leaves a bad taste in our mouth. Yet, it is only through death that the great Christian paradox, that eternal life comes through death, can be experienced. We remember Jesus' words: "Unless a grain of wheat falls into the earth and dies, it remains just a single grain; but if it dies, it bears much fruit" (John 12:24). In order to appreciate fully the significance and power of the Incarnation, the Church asks us to consider our mortality and need for God while exhorting us to vigilance and preparedness in our day-to-day Christian journey. The parable of the doorkeeper challenges us to wait patiently and be ever watchful for Jesus' coming, for we do not know the day or the hour. The parable of the doorkeeper is contained in different versions in all the Synoptic Gospels. The presence of this pericope in all three books demonstrates much more than a common source. Clearly the apostolic Church considered the exhortation to watchfulness to be of primary importance. Application of this parable to the entire Christian community has made its imprint in the text of all three Synoptic authors. Matthew (25:14-15b) and Luke (19:12-13) cast the parable in a different light than Mark. These two evangelists speak of a master who entrusts his servants with his goods, goes on a journey, and when he returns, judges their accountability. The exhortation to watchfulness, which Mark connects to the master's journey, serves Matthew (24:42 and 25:13) and Luke (12:38) as an addendum to other teachings. 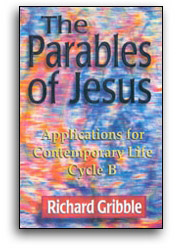 Although the placement, method of presentation, and purpose of the basic parable differs for the three evangelists, all highlight the application of watchfulness as an immediate need for all disciples of Christ. First Lesson: Isaiah 64:1-9. Writing to the Hebrews after their return from exile, Isaiah recaps his understanding of Israel's relationship with Yahweh and how it has been experienced in the past several generations. The prophet tells the people that God is their Father, but Israel strayed and hardened its heart against the Lord. Realizing their guilt, the people have now returned to the Lord and God has rescued them from the Babylonians. Isaiah tells the people that God will act for those who have the courage to wait. Patience and the ability to persevere will lead to deeds and wonders that no person has heard or seen. The prophet's exhortation to the people to be patient and allow God to act coincides closely with the Lord's call to watchfulness in the parable of the doorkeeper. At times we all become frustrated at what we perceive to be the tardiness or failure of the Lord to respond to our prayers and petitions. We know, however, that God does not act on human time. The need to be ready and watchful must thus be united with the ability to be patient and allow God to act. In our ability to wait we find strength, and while we wait God hones and refines us, molding us to be the vessels that can better serve his divine plan. Second Lesson: 1 Corinthians 1:3-9. Saint Paul, like Isaiah with the Hebrews, exhorts the Christian community at Corinth to wait patiently for the revelation of Jesus Christ in the Parousia. Christ's coming in glory and power was a cardinal doctrine of Saint Paul's preaching and the main object of Christian hope. Paul speaks of how our faithful God has called us to fellowship with Christ. Thus, when the Lord returns those who have been faithful, patient, and observant of his teachings will reap a great reward. As with Isaiah and Mark's parable, Paul clearly teaches that a life of vigilance, watchfulness, and patience will be rewarded with the eternal presence of God.